Presented to every new inductee/member of the Lowell High School Athletic Hall of Fame is a medal, a commemorative plaque, and a DVD of the ceremony for a keepsake. Text from establishment letter, given along with medal and plaque to each new recipient. Each previous inductee was retro-actively given an egnraved medal. Recipients, past and present, Spouses of Deceased Recipients, and Members of the H/F. John J. Beaulieu, elected LHS H/F, 1997. 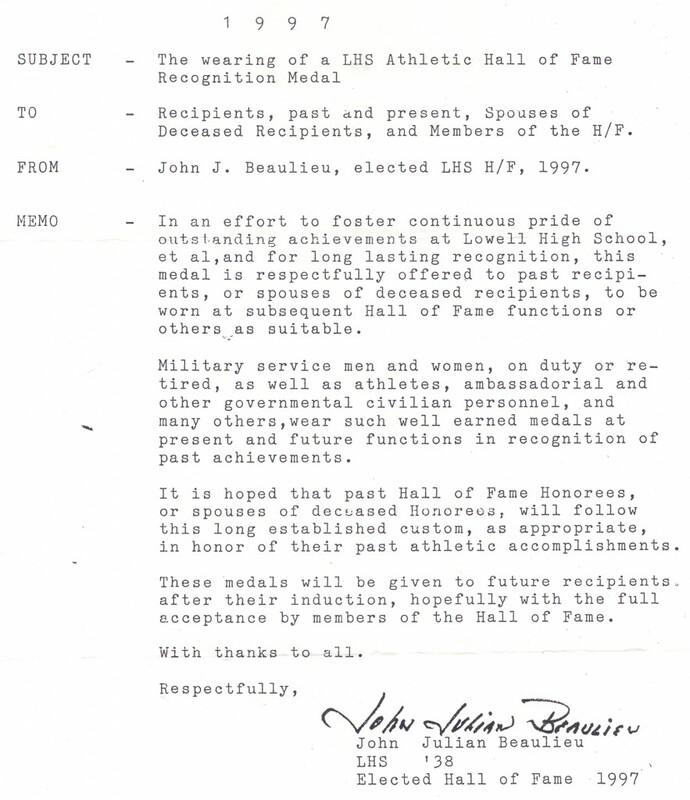 In an effort to foster continuous pride of outstanding achievements at Lowell High School, et al, and for long lasting recognition, this medal is respectfully offered to past recipients, or spouses of deceased recipients, to be worn at subsequent Hall of Fame functions, or others…as suitable. many others, wear such well-earned medals at present and future functions in recognition of past achievements. It is hoped that past Hall of Fame Honorees, or spouses of deceased Honorees will follow this long established custom, as appropriate, in honor of their past athletic accomplishments. These medals will be given to future recipients after their induction, hopefully with the full acceptance by members of the Hall of Fame.